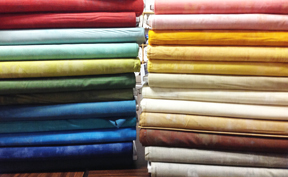 The Quiltzette - News from Cortez Quilt Company - New Fabric, Many Events! A big thank you to everyone who came out to our marathon clearance sale Friday before last. See what you helped us do? This box was EMPTY at the beginning of the sale. All these empty bolts mean we're ordering even more new fabric! Speaking of New Fabric . . .
We're now carrying the Grunge line from MODA. It works well for both traditional and modern quilts and the colors are amazing. These came in last week and we'll be ordering more of the 67 colors soon. This elegant cream and dark red collection also arrived last week. And for something playful . . . we have cats doing yoga! 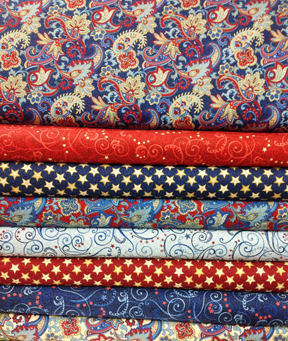 This eight-piece patriotic collection came in last Friday. Cream, red, and white. Isn't that paisley print beautiful? Note: We're now repeating the 12:30 p.m. program at 5:15 . . . come after work! Customer Appreciation Day – Friday, November 29, 10 a.m. – 5 p.m.
We’re continuing our tradition again this year with Customer Appreciation Day (CAD). This is the one day during the year that you can get your very own CAD Card! Spend $25 and your CAD card is free. Then use it once a month throughout 2015 to receive one yard of free fabric when you purchase three yards. Also, fill out your holiday wish list, tell us who to mail it to and be entered to win a $50 gift certificate! BERNINA DesignerPlus 7 Embroidery Software Demo, Wednesday, December 3, 5:15 – 6: 30 p.m.
Cindy Dahl recently spent a week at BERNINA headquarters in Chicago learning all about the amazing things that can be done using embroidery software. Join us on Wednesday, December 3 when she will give an overview of the software available from Bernina: Embroidery Software 7 Designer Plus, Embroidery Software 7 Editor Plus, DesignWorks Suite (CrystalWork, CutWork, PaintWork) and the free ArtLink software. She will provide demos, show samples, and discuss the benefits of each product. Make plans to attend if you already have embroidery software and want to see the newest version or if you’ve been thinking about upgrading to an embroidery machine. This event is free. Please RSVP as we will serve light refreshments. Our very nice customer Marcia Kerans from Durango makes these handy and well-crafted thread caddys. Great when you're doing hand work, the caddy holds your spool of thread, scissors, needles, and thimble with a series of dowels and magnets. Marcia gave us eight of these to offer for anyone who would like to make a donation to For Pet's Sake, our local humane society. 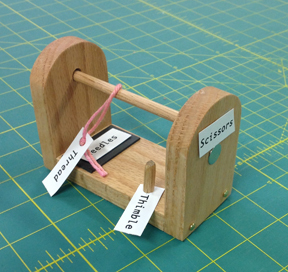 We're recommending a donation of $20 for for this very nice made-with-love item. Please bring a check made out directly to For Pet's Sake if you would like to help out. And THANK YOU Marcia for thinking of us and pets who need to find forever homes in Montezuma County! 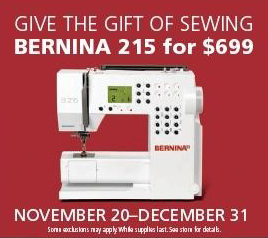 And there is a special offer on the BERNINA 215. This is a VERY good price for a VERY nice machine! Offer good from November 20 through the end of the year. And if that's not enough to get you excited, how about a special financing offer? Ask us about 60-month ZERO percent financing! This offer applies November 20 through December 3 and is good for purchases of $3,000 or more. Or choose 36-month ZERO percent financing from November 20 through the end of the year, again on purchases of $3,000 or more. See this page of our website for more details on financing.